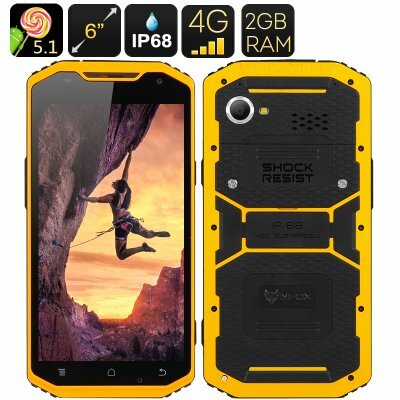 Successfully Added MFOX A10 Rugged Smartphone - 6 Inch 1920x1080 Screen, 64 Bit MTK6752 Octa Core, IP68, 2GB RAM, 4G, Android 5.0 (Yellow) to your Shopping Cart. Get a smartphone that matches your active lifestyle and can follow you on any adventure, whether it’s hiking up the mountain, rafting down the river or base jumping from a skyscraper. Even if nothing that extreme is on your mind right now, the MFOX A10 will be a practical everyday companion as well. Dustproof, waterproof, coming with Android 5.0 and 4G, it’s as functional as it is tough. The MFOX A10 is a rugged smartphone and that means you won’t have to worry about the consequences of dropping your phone into water or letting it roll around in the sand. In addition to the rugged qualities, the MFOX A10 is a practical device for everyday use. It comes with a nice 6 inch 1920x1080 screen, so that you can fully enjoy all your media on a large display. Your MFOX A10 will come with the Android 5.0 OS, letting you experience all the upgrades first hand. With 4G and the support of two SIM cards, you are also getting a phone with great communicative functionality. The smartphone comes with up to 16GB of internal memory, to which you can add up to 32GB externally. Thanks to the 3500mAh battery, you will have up to 6 hours of continuous playback and up to 120 hours of standby. The MFOX A10 Rugged Smartphonecomes with 12 months warranty. Brought to you by the leader in electronic devices as well as wholesale Android smartphones, Chinavasion..